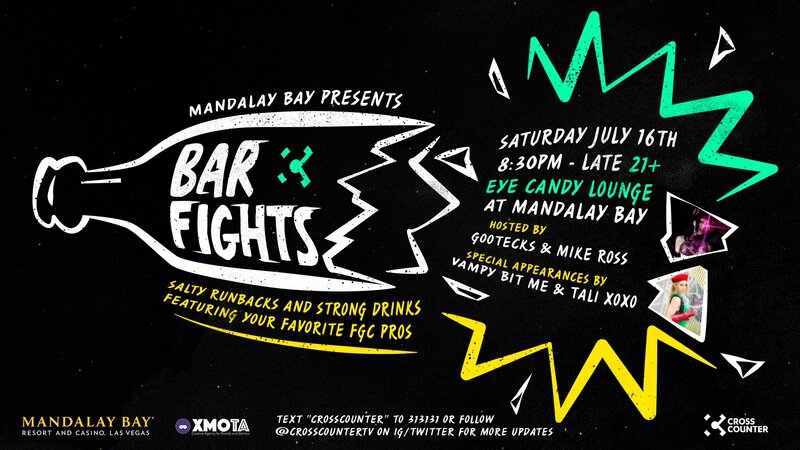 Cross Counter TV presents Bar Fights at The Eye Candy Lounge in Mandalay Bay this Saturday July 16! Level Up is teaming up with Cross Counter TV to provide the stream featuring pro fighting game players in various exhibitions during EVO weekend! Special guest appearances from Vampy Bit Me & Tali, Salty Runbacks, and Strong Drinks in an awesome venue hosted by the gracious Gootecks and Mike Ross makes this night a must see! Hope to see everyone there or catch the stream with your friends on twitch.tv/crosscountertv at 8:30PM PST!